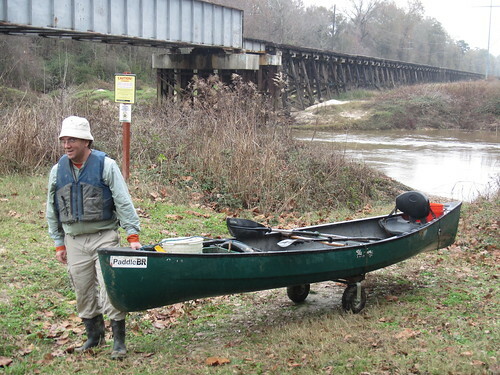 With good weather and enough water in the Comite River to not drag on the sandbars, Mike and I decided it was time to head down the Comite River (and up the Amite River a bit) to try the Blackwater to Frenchtown run. Blackwater Conservation Area and Frenchtown Road Conservation Area are two BREC parks with Comite River frontage and paddle access. At Blackwater, it’s half a mile on basically flat walking trails to get from the parking lot to a sandbar at the bank of the Comite River. Ten miles downstream, you reach the Frenchtown Road Conservation Area. 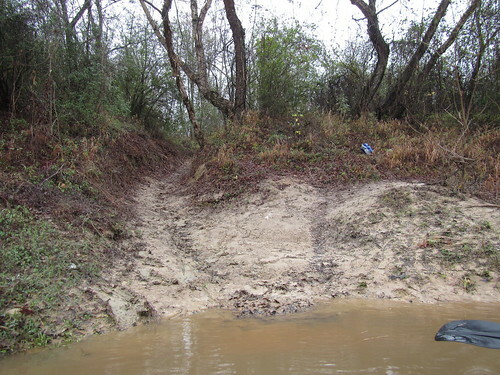 Unfortunately, there is not yet Comite River paddle access at Frenchtown (although we’re certainly working toward it). 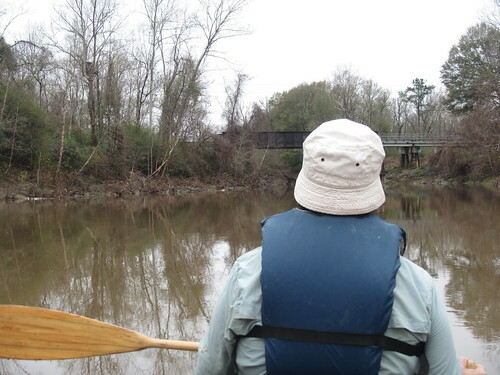 You continue another 1-2/3 miles to the Amite River, then turn upstream and paddle another 2-1/2 miles to reach the Amite River access trail at the northeast corner just below the railroad bridge. Then it’s half a mile over hilly terrain to get to the parking area. Fortunately, we have a canoe dolly. 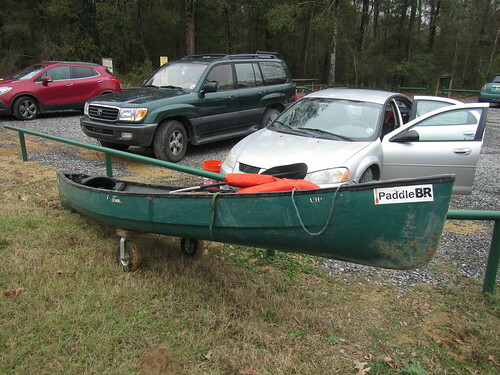 (It’s two 10″ pneumatic casters screwed to a piece of 2×6, with a ratchet strap to hold the canoe — super heavy duty, and under $30 with a coupon.) Perhaps we can get better access and closer parking in the future, but half a mile isn’t a big deal with wheels (and if it’s too big a deal for you, just outsource the transport to your friendly local PaddleBR rep — I volunteer Mike for the job). We’ve done the Blackwater walk plenty of times, so it was no problem, and it was about time we did some more local paddling with “river” in the name. We were underway and heading down the Comite by 9:30am. It’s been a while since Mike and I been in the same canoe and going downstream in a river, but Mike quickly realized he didn’t need to use his kayak paddle. 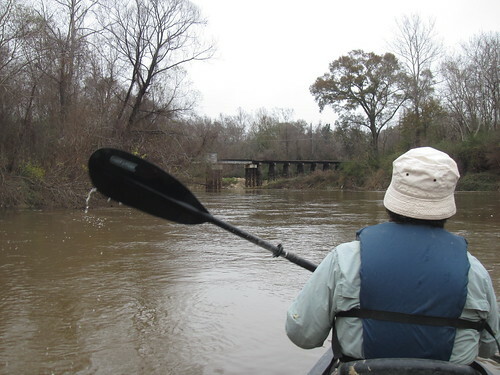 He seemed quite happy to be able to find himself in the front seat of a canoe with a nice wooden canoe paddle, and he was comfortably in his element even before we passed under the Hooper Road bridge mere minutes after launching. About halfway to Frenchtown, 4.8 miles downstream from the launch point at Blackwater, there’s a pipeline crossing. At low water levels, there is a cascade over rip-rap, and there is a very, very brief stretch of “rapids” with a nice channel to shoot. If I said it was 15 feet long, I would likely be stretching the truth, and the drop is mere inches. 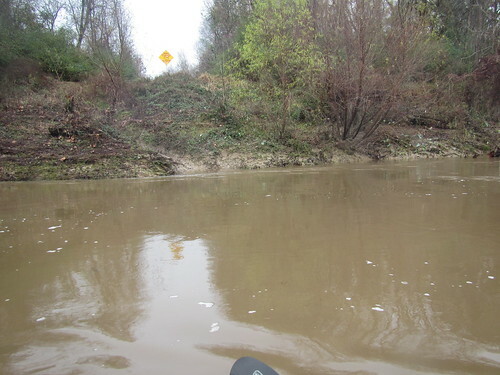 Still, at low water levels, it’s a fun little spot where you may get a bit of water over the side of a canoe — just keep the pointy end forward as you go through and you’ll be fine, but wear a PFD, naturally. With the water up even a foot, however, the cascade completely disappears and you only know it’s there if you watch for the pipeline crossing signs. About five miles and a few bridges and powerline crossings later we made it to the railroad bridge that marks the start of Frenchtown Road Conservation Area on the east bank. At some point in the future, we’ll be able to put ashore right around this spot and make the half-mile (more or less) walk back to the parking area. 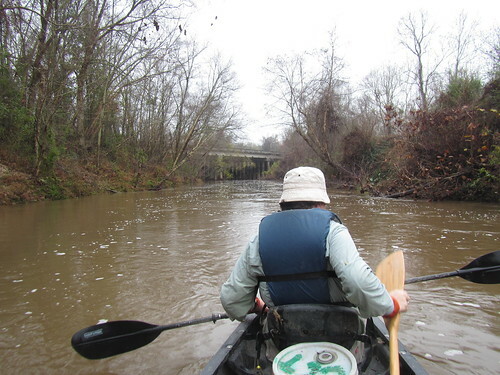 A 10-mile downstream paddle seems a reasonable length for novice-level paddlers wanting a good day on the water, with the mile of walking (split between launch and recovery) turning it into a nice but not excessive amount of exercise. Well, I guess it’s about time I got to the point. So, we continued along the Frenchtown bank until we got to the Amite. (The next bridge is Florida Blvd. 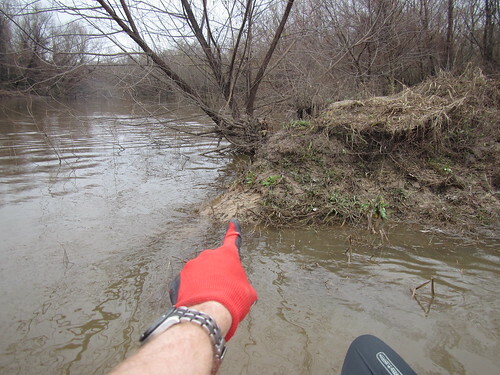 If you cross it, you’re heading toward Port Vincent a bit over 20 miles downstream.) Not wanting to go to Fred’s this time, we turned around the point (making the point with a point at the point) and started upstream on the Amite River. This segment was not one that you would want to do as a novice paddler. Mike is well seasoned, and I put in my hundreds of miles, so we were ready. Since we wanted enough water in the Comite to paddle without hitting sandbars, that also meant that the current on the Amite would almost certainly be stronger. 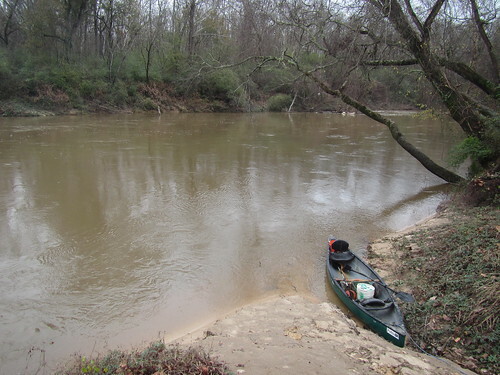 This being the plan, we took it easy on the Comite heading downstream, and when we hit the Amite, we were both fresh and paddling hard with kayak paddles. We actually did better than I’d expected. We averaged around 2mph over the entire 2-1/2 miles of paddling upstream, completing the upstream leg in a mere hour and fifteen minutes. There’s something to be said for having two strong paddlers in a canoe when you’re going upstream, but I think I could do it decently well solo (especially in a kayak or my solo canoe). If you’re a strong paddler, it’s not *that* difficult a trip, but it *is* the last 2-1/2 miles of a 14.2-mile trip (with half a mile of hilly dolly rolling left). For everyone else, it’ll be much better once there’s Comite access so the whole trip is downstream (and only 10 miles on the water). It was a relaxing walk back to the parking area. (And it was nice to stretch, too.) Then we loaded everything up and headed back to Blackwater to get my car and head home. Total time from leaving the parking lot at Blackwater to returning to it was five hours, with about 3:40 of that being actual time on the water. It was quite a nice run, and once there’s Comite access at Frenchtown, we’ll definitely have to work up some more conditions reports and perhaps some signage (the bridges would look nice with labels). For now, it was a very enjoyable day on the water, and quite different than our usual bayou paddling. I’m looking forward to doing it again. Did you notice any untreated raw sewerage entering the Comite when you passed Cypress Bayou canal? I noticed nothing adverse in the entire run, and I’m pretty well versed in the smell of raw sewage. I’ve followed my nose to find several unpleasant sources, but I smelled nothing on this trip.